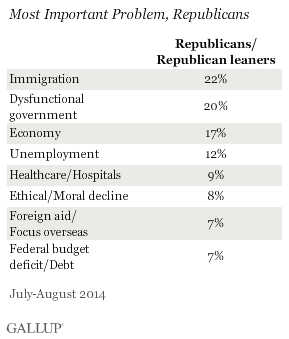 Among Republicans, immigration has eclipsed health care, the dysfunctional government and the economy as the No. 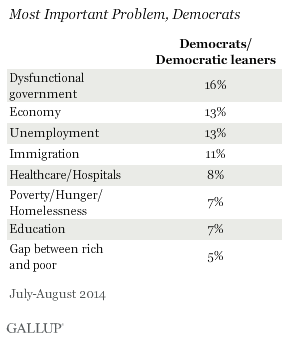 1 problem ailing the United States, according to the latest Gallup poll. Twenty-two percent of Republicans or Republican-leaners name immigration as the country’s top problem; 20 percent named the dysfunctional government, 17 percent named the economy and 9 percent named health care. By contrast, Democrats’ top concern was the dysfunctional government, at 16 percent, followed by the economy, at 13 percent. Immigration was fourth on the list, at 11 percent. The survey comes in the wake of an influx of thousands of unaccompanied Central American children who have been apprehended at the southwest border. It also comes ahead of an expected executive action by President Barack Obama which is expected to include deportation relief for some undocumented immigrants who have been living in the United States.